ASTEROID FLYBY: This week asteroid 1862 Apollo is flying past Earth. Closest approach: 11 million kilometers on May 8th at 1500 UT. Discovered in 1932, Apollo was the first asteroid recognized to cross Earth's orbit. It measures 1.7 km wide and has a tiny 75 meter wide moon. In the nights ahead, southern hemisphere astronomers with big backyard telescopes may be able to photograph Apollo glowing like a 13th magnitude star as it glides through the constellations Microscopium and Grus: ephemeris. Note the dark filament emerging from the core of the sunspot. 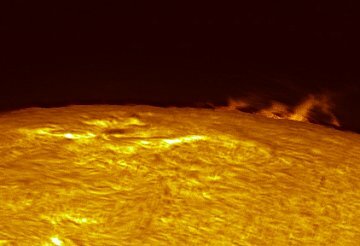 As the sunspot crosses over the limb, the filament briefly will jut out into space, possibly creating a nice photo-op for astronomers with solar telescopes. Stay tuned! 3D BONUS: Using digital trickery, Emiel Veldhuis of the Netherhands, transformed a flat photo of sunspot 953 he took on May 2nd into a fun 3D anaglyph. The filament leaps right out at you! Put on your 3D glasses and take a look. more images: from Michael Borman of Evansville, Indiana; from John C McConnell of Maghaberry, Northern Ireland; from Mike Strieber of Las Vegas, Nevada; from Dave Tyler of Buckinghamshire, UK; from Jörgen Blom of Stockholm, Sweden; from Peter Paice of Belfast, Northern Ireland. "I did not use any filter," says Davoodian. He didn't need one; the colors are naturally present and only need a bit of boosting with Photoshop to see. The method is described here. What do the colors mean? Blue denotes areas rich in titanium, while orange is titanium poor. The titanium-rich zones are particularly interesting to NASA. 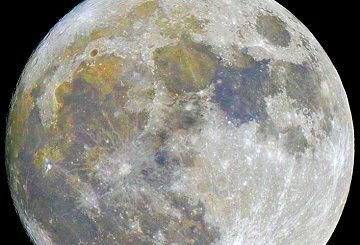 Most lunar titanium is bound to oxygen; the common lunar mineral ilmenite, for instance, is rich in titanium oxides. This oxygen may be easily extracted, providing future explorers a source of air to breath and oxidizer for rocket engines. Blue is good!